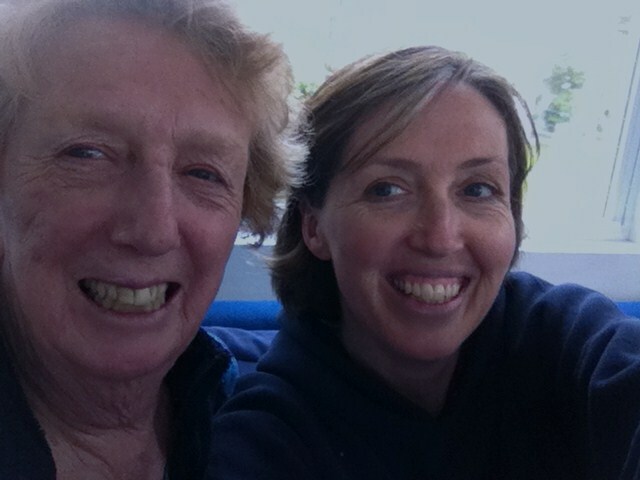 My mother and I pose for a selfie the day before Mother’s Day. Swinging a black guitar case and smiling ear to ear like Maria Von Trapp from “Sound of Music,” my mother came walking down the hallway of my high school. She had signed up for an adult education class, which ended at the same time as my basketball practice. How convenient for rides home. I remember feeling simultaneously embarrassed and proud. Before bookstores ever offered self- improvements sections, my mother was always seeking out new experiences to broaden her horizons. I grew to love hearing her sing John Denver’s “Grandma’s Feather Bead” before school (and after school, and before dinner and after dinner, and before bed … ) I really did. Some 30 years later, I feel only pride when I think about how my mother pushed herself to try new things. I am not talking about scaling Mount Everest or jumping from airplanes. But out of five sisters, my mother was the only one to get a job in Boston right out of high school instead of staying closer to their small town. She taught herself to sew our clothes (and our dolls’ clothes), make bread, cross-country ski, arrange flowers, start a business to sell those arranged flowers and drive through the tunnels of Boston. She is savvier than a lot of people give her credit for, including herself. I decided to launch this blog today, on Mother’s Day, because I want to be more like my mother. Over the course of the coming year I want her to teach me her skills. I want to approach life with an openness to new opportunities. Like my mother, I want to go to a restaurant, eat a delicious meal and then find a way to recreate it at home. Maybe even make it better. My mother isn’t quite sure about this new endeavor of mine. She’s a private person. I assured her that the blog isn’t confessional in nature. I told her that this is for me, for us really, and most people won’t even read it, which is probably true. But I hope it’s not entirely true. I think we can have some fun with this. I have had the privilege of working with your mom for the past 18 months. When she told me about your blog I couldn’t wait to read it! I wanted to share with you some things that I have learned from this wonderful person, your mom. When in doubt add white! Thanks Kathy so much for reading and replying. My mother loves her friends at Harvest of Barnstable. Thanks for keeping her laughing. Hi Susan! Sarah sent me your blog and I was so delighted to read all of it…feels warm and fuzzy and brings back so many happy memories; it transports me back to the Island and all of the kiddos. What a grand thing to do. Kisses and hugs to all. With much love to all and with much anticipation of happy reading . Mrs. K.
Susan and Mrs Flynn please know that my childhood was rich indeed growing up with The Flynn on Prudence. Susan be sure to consider a nod to our beloved island. The Peach reigns on you Gong Show Host! What greater gift than to grow up to be just like our mothers and our Nanas. I want that as well to be a strong creative woman and a loving mother who celebrates her children everyday.